For the past two years, Google has offered Commerce Search, a hosted enterprise search product to power online retail stores and e-commerce websites. While Google offers hosted enterprise search to web platforms, Commerce Search was the the company’s first custom-tailored search product for a specific vertical. The search giant has been steadily updating Commerce Search since 2009, but today’s release is the retail search product’s most significant update in the past two years. The first two versions of Google Commerce offered a variety of features that are optimized for retail and product search, such as parametric search, sorting of results, spell checker, stemming, a merchandising dashboard, query autocompletion and more. Google even dropped the starting price of Commerce last year, to $25,000 per year for 3 million searches and 50,000 items indexed. Google’s new version of Commerce Search has been updated with a few more compelling features including instant search, local product availability, search recommendations and more. Google introduced Instant Search last Fall, which enables results to dynamically change as you type. Google has added this feature to Google Commerce search, and will return product results within search with every keystroke from the search bar. Google introduced local product availability in its own Product Search last November, and is now offering the same feature to Commerce Search customers. Online retailers can offer more data on whether a product is available in the retailer’s nearby brick and mortar store, within search results. Another useful feature in the new version are product recommendations. So when a user searches on Commerce Search, Google will show similar products that other customers viewed and bought. Enhanced merchandising tools allow retailers to create product promotions that display in banners alongside related search queries, and to set query-based landing pages (for example, when a visitor types [shoes], they’re directed to a “shoe” page). 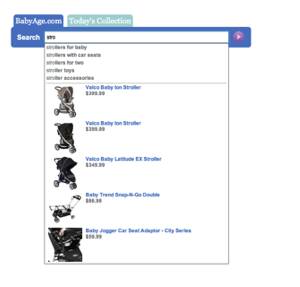 And Google has made Commerce Search mobile friendly, so retailers can easily incorporate search into mobile sites. Google has added a number of well-known retailers to the Commerce Search platform over the past year, including Forever21, General Nutrition Company (GNC) and L’Occitane. Google faces competition from Omniture, IBM, Endeca and others.